With our flexible scheduling, we cater to you at a time that is convenient for your business. Schedule service when it makes sense for your staff and your customers. 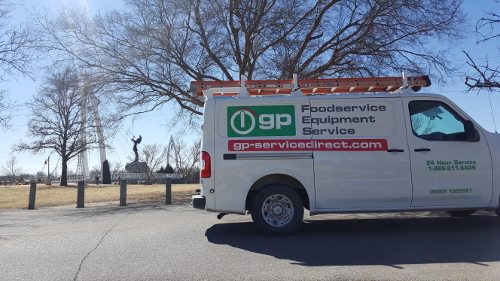 If you would like to learn more about how our restaurant equipment repair can help, call us at (316) 315-0044 or email KSDispatch@GP-ServiceDirect.com. We look forward to speaking with you. Flexible scheduling – We are available when other commercial appliance repair and service companies are not. Just tell us when you need us, and we will be there. Installation – Our technicians are trained to properly install most brands of almost every commercial appliance and foodservice equipment. Repairs – Call us for any food equipment service needed. Our factory-trained, industry-certified technicians will repair anything that breaks down or stops working to specification in your restaurant or facility. All of your commercial equipment is safe in our hands. Small Commercial Kitchen Appliance Repair – Drop off any small appliance that needs repair, and our technicians will take care of it in our onsite repair shop. Planned Maintenance – Prolong the life of your equipment, protect food consistency and keeping costs down are all benefits of a planned maintenance agreement. Regular equipment maintenance is one of the most important ways you can keep your kitchen running efficiently whilst maximizing your return on investment. We custom-design maintenance plans for your specific needs. Emergency Services – Our emergency technicians are available to assist you with restaurant equipment repair 24 hours a day, 7 days a week, 365 days a year. Online Account Information – Our online Customer Portal is available 24/7 for easy access to account service history, open & closed tickets and more. Click here to request access. Progress Reports – When requested, we utilize an Automatic Status Update System that emails our customer progress updates throughout our service. This is extremely useful to facility managers who cannot be present during our service. Simply call this branch to activate the service. Quality Parts – Our technicians utilize the vast inventory we hold of O.E.M. replacement parts and manufacturer recommended care items when conducting repairs. Should you prefer to repair your own equipment, we have you covered with the parts you need for the job. To order, shop online at GP-PartsDirect.com where ground shipping is free when you pick the part up at our Wichita location. Warranty – We believe in our work, and so should you. All of our services are backed with a 90-day labor warranty. We value your peace of mind.